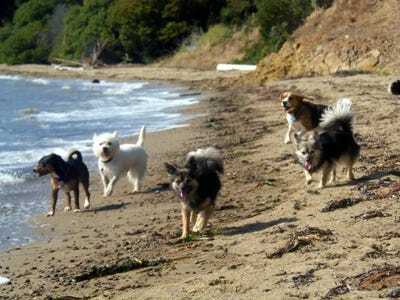 DogVacay.comLisa Ascarrunz lives near the beach in California, where she regularly takes her boarders (pictured). In 2008, amidst the upheaval of the American economy, Lisa Ascarrunz lost her job in the telecom industry. To support herself and to be available to care for her ageing parents, Ascarrunz started dogsitting. As she started taking in clients through Craigslist and supplementing her unemployment, she realised that although the gig was supposed to be a stopgap measure, it was bringing in enough money to support her Bay Area lifestyle outside Berkeley, California. After a few years of patching together dogsitting jobs, Ascarrunz signed up with DogVacay, a website that just raised $US25 million to facilitate dog boarding and care in different cities across the US. She and her partner, who also cares for dogs full-time, are now some of the company’s highest-rated caretakers. On any given day, they have 8 to 9 dogs at their home: two of their own (Gus, a labradoodle, and Taco, a chihuahua/terrier mix), a few fosters, and a few daycare attendees ($US30/day) or overnight boarders ($US40/night). DogVacay.comOne of the hardest parts of regularly having half a dozen dogs in her home, Ascarrunz says, is the wear and tear. The hardest part is what you might expect: the wear and tear on her house, and the cleanup. 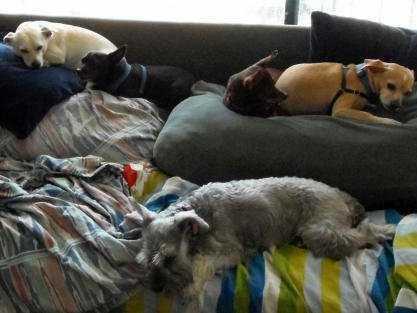 While Ascarrunz says she hasn’t taken the time to sit down and figure out exactly how much money her dogsitting brings in, she explains although it can fluctuate widely, she’s never had a problem paying her mortgage or bills.